The finale has been presented and the fun and excitement has been had for Mercedes Benz Fashion Week Australia. Although I previously had yet to take in the seemingly more sybarite presentations of the laid back yet poised superlative city of the Southern Hemisphere, I'm pleased as pie to have gotten to report on the collections this year. Opening the week with an insanely picturesque setting and an impressive, emphatic and dramatic collection from "Australia's Alexander McQueen" Toni Matecevski, things were off to a good start on this side of the Pacific from Day One. There was much talent to be admired as the collections were rolled out on the runway, and Oscar de la Renta did not disappoint with a glamorous, couture-centric finale. But what did Fashion Week require prep-wise down under? Would my arsenal of standard FW beauty loot help me avoid discomfort and disorganization just the same on this side? I did a little readjusting; (luckily, albeit sadly) my Chloé Fur Heather Wedge Ankle Booties were a little unnecessary (still love you guys, though!). Here's what did made the cut to come along with me for the ride for maximum efficiency and well-being while attending the shows. Sunscreen year-round is a non-negotiable anyplace on the planet, but in UV-soaked (read: damaging) Australia, it's imperative to up protection. 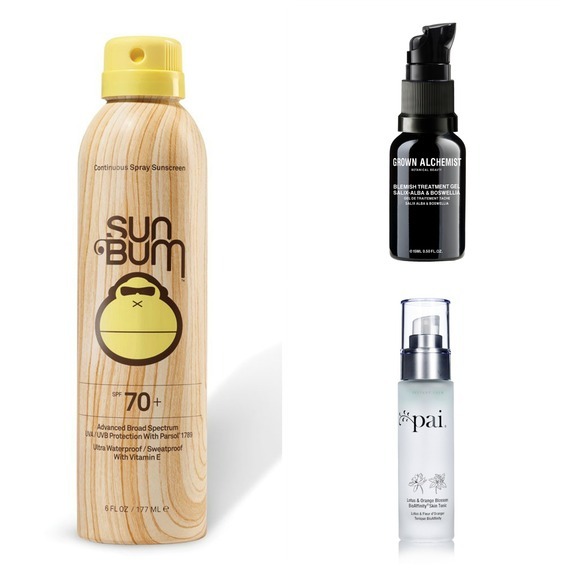 Sun Bum smells super yum, emits a superfine mist from an easy to use aresol can, dries down to a sheer, invisible shield in seconds and protects and nourishes skin with Vitamin E. Yeah, I can't find an SPF I love more, either. Knowing my sleep schedule, level of champagne intake and bursts of stress are bound to happen during the chaotic week, I ensure I have a really good blemish-fighting treatment to keep the baddies at bay and my complexion clear. Australian skincare brand Grown Alchemist did a bang up job with their Blemish Treatment Gel: Salix-Alba & Boswellia. Formulated with plant-based active ingredients, like Guaiazulene from Blue Cypress and Bisabolol from Chamomile that work with your natural biology, skin is rid of impurities, decongested, soothed and left even and clear. I followed this treatment up with a double dose of face masks (because two is always better than one, right?). First, I applied Cosmetic Queen Charlotte Tilbury's Goddess Skin Clay Mask. A backstage staple for prepping and beautifying models' skin, I felt that much more Fashion Week ready the moment I used Tilbury's famous and mega effective wonder workout massage technique to apply this creamy mask. 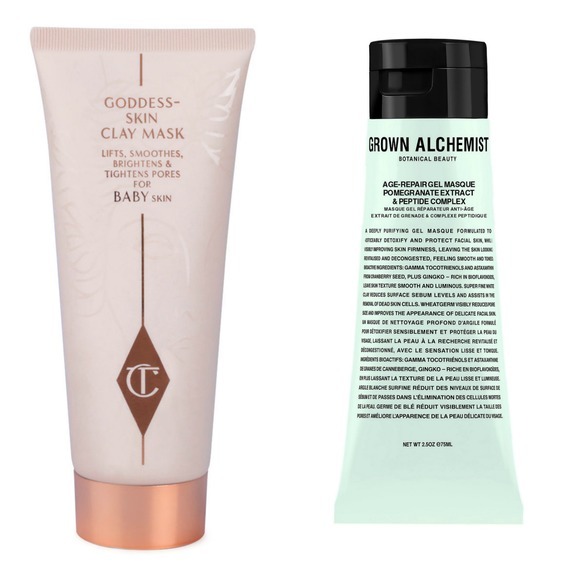 Unlike other clay masks that dry out your complexion, this beautifying, thick and perfecting treatment draws out impurities while adding a generous dose of moisture and elasticity, thanks to a collagen-boosting peptide-complex and essential oils. Incredibly soft, fresh and dewy skin is revealed, and I'm left practically feeling like Gisele. Next, on alternating days (and especially after a really late night/ a day of poor nutrition/ pretty much anything that could make skin dull and sad-looking), I swiped on Grown Alchemist's Age-Repair Gel Masque: Pomegranate Extract & Peptide Complex to refresh and make my skin look all glowy again. Even the most fastidious faces are sure to feel fab after application; formulated for sensitive skin, this supremely hydrating mask boasts cooling (read: feel good) properties to soothe stressed out skin. The result? A smooth, toned, refreshed and luminous complexion, making whatever came my way easier to take on when it didn't show on my face. My secret weapon for freshening up midday was Pai's Lotus and Orange Blossom BioAffinity Tonic. No matter how small my bag, this vitamin-, mineral- and amino acid-rich spray is so easy to take on the go to instantly hydrate and balance skin. Bonus: the all-natural 'living water' instantly revitalizes and calms, thanks to its spa-like scent. Waking up to a blaring alarm at 7 a.m. after a night of too much champagne at the after party is exactly no one's idea of fun. I skipped hour-long blowouts and still looking (my best) runway-ready with a few spritzes of Shu Uemura's Wonder Worker. This stuff really lives up to its name -- work a little through mid-lengths to ends post-shower, and its specially formulated air-dry perfecting properties ensure stands are flawless, sans hairdryer or heat tools. The Moringa-rich formula instantly hydrates, smooths, conditions, and tames frizz while boosting radiance and silkiness, and the addictively luxurious scent makes it perfect for an afternoon refresh. For a quick shot of sleekness, I flicked a tiny bit of Kérastase PARIS Solid Serum in Oil through the ends. An innovative solid serum infused with beautifying (and beautifully scented) oils, I tossed this balm in my bag for a mid-day pick me up -- it's like a solid perfume for ends that scents, smooths and boosts shine. Define ends with a small dab warmed between fingers; it instantly melts, making it a perfect anytime, anywhere hit of hair nutrition and definition. 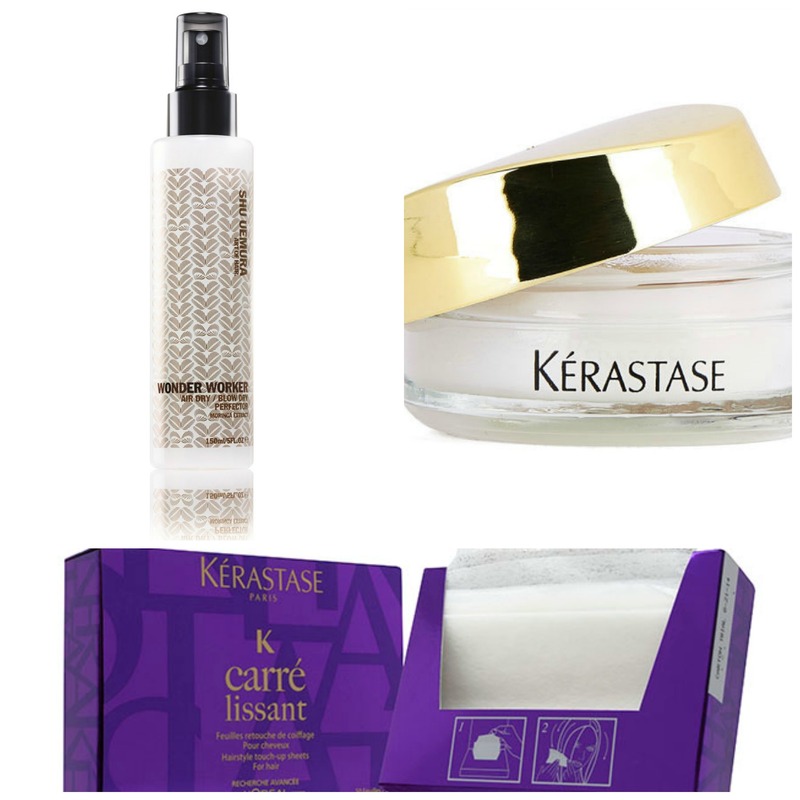 When I needed a quick swipe of frizz-fighting hair help (hi, Australian May humidity), I needn't look further than Kérastase PARIS' Carré Lissant. They're like bounce sheets, but waaay better: specifically designed for hair (and not, you know, cotton tees), these delightfully scented wonder wipes make unruly hair perfect: not only are they supremely easy to use and leave strands delicately scented, they eliminate frizz, control static, tame flyaways, block humidity, and combat dullness. Plus, they are easy to toss in your bag -- no matter how small (love you, Chloé Drew mini). Australia is inarguably internationally known for its beaches/ beachy babes. 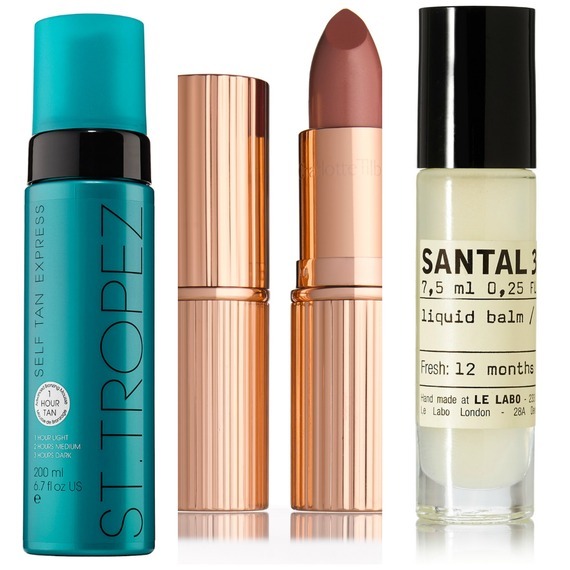 Staying true to that notion, I took a cue from Mercedes Benz Fashion Week Australia's backstage beauty must and swiped on St. Tropez's Self Tan Express Bronzing Mousse. With mere minutes to spare, this lickety-split to dry mousse is airy (read: foolproof to apply and blend) and develops in as little as one hour, meaning I never missed a beat during the crazy busy schedule. Plus, the reigning royalty of backstage, Kate Moss, is the face of the brand, and I'm up for trying anything that will marginally emulate Queen Kate. The definition of resilient makeup for me is Charlotte Tilbury's K.I.S.S.I.N.G Lipstick Fallen From The Lipstick Tree in Stoned Rose. The perfect lip-defining shade, this creamy bullet took me from 9 a.m. backstage interviews to 9 p.m. dinner parties, and looked perfectly placed here, there and everywhere in between. It never feathers, feels luxuriously rich, and is enriched with light-diffusing pigments that give lips a brilliant, luminous and pouty finish. Plus, the iconic rose gold tube looks really chic when touching up. Bisous, MBFWA! No matter the silage, eventually, your scent will fade. This is why I always carry a mini fragrance rollerball with me, and touch-up whenever the mood strikes. Right now I'm loving Le Labo's Liquid Balm in Santal 33. With its addictively warm, leathery and woody unisex fragrance, it's reminiscent of my better half, and I take comfort in feeling like he's right there with me during long days (and nights) spent apart. Cardamom, iris, violet, and ambrox blend beautifully with Australian sandalwood and cedarwood, and I am always asked what I'm wearing by both men and women alike whenever I swipe on this liquid balm. 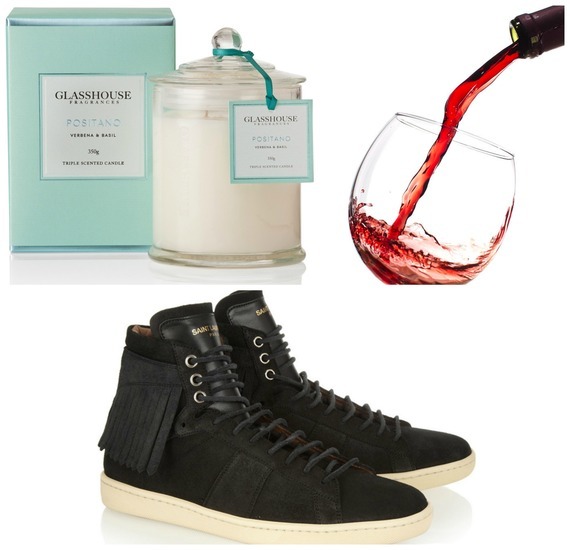 For me, a non-negtiable necessity is flats, but not necessarily ballerina flats -- I'm a high top girl all the way. But a pair of flat shoes is an absolute must for long days. Most of Sydney's presentations are in relatively close in proximity, but that doesn't mean standing around for five shows feels good with pinched toes and no circulation below my ankles. Totally not worth it, no matter how chic my Saint Laurent Janis pumps look with my outfit. As I write this, I'm currently inhaling the intoxicatingly sanguine scent of Glasshouse Fragrances' Triple Scented Candle in Positano. Working late requires an energizing boost, but at this hour, caffeine is out of the question (so I can actually, you know, sleep tonight). Instead, I'm scenting the air I'm breathing with the gorgeously bright and sparkling fragrance reminiscent of a seaside oasis. Nicole Eckels, Creative Director of Glasshouse Fragrances, explains, "For motivation and energy I look for strong vivid fragrances that open up your senses. Stick with zesty, fresh scents that create a burst of energy such as crisp citrus, zesty fruits, green leaves and cool aquatic notes." Same, Nicole! Wine. Preferably Grenache. Need I say more?